brains as joysticks/x-boxes of gambling protozoas and parasites - and where is humankind? Is neurology, manipulation, altruism, behaviour of protection, farsighted and complex planning a sign of intelligence and humanity? The project is about insects, who operate with neurotoxins-injections to paralyse and/or influence their victims to a strange behavior. Several stories are to be told. The drawings from Europe represent the perpetrator insect, and the male dancer from Asia represents the victime. There will be an electronical sound-track combined with live-music. The musicians react perfect to the dance, which shows the unbelievable drama of a microcosmic universe. The video, which shows the perpretator insect as well as the neurotoxic operations, will be beamed on screens and will describe the neurotoxic influence and psychotic action. or do you (still) don’t like them? inSection is a real contemporary cross-disciplinary project. The cultural diversity of Asia and Europe, the combined mentalities, different technics and perspectives come together within this very special project. 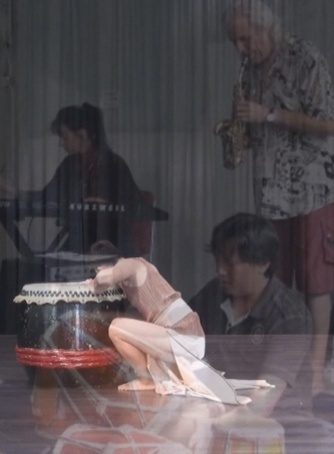 Each discipline will be improved of an Asian and a european artist, combined together to a new language. We got 4 nations within inSection (France, Switzerland, Indonesia and Malaysia) and 4 Arts: visual, video, music, dance – all to be performed live in public, it’s sustainable (longlasting collaboration of the artists since years, planed to go on), we create the dialogue and exchange within each discipline of the 4 Arts as well as through the project, as well as through the nations as well as through Asia and Europe. 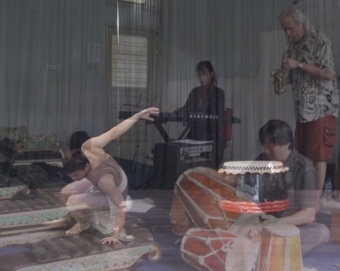 The dancers, musicians and the visual/video performers of inSection all verify each their typical cultural differences as well as coming together, finding a way of common communication within their discipline in this multi-lateral project. The work-out will be done in Europe as well as in Asia, having performances with the show at several destinies in Indonesia, Malaysia, France, Switzerland and Germany. The initiators of inSection JOPO & Ingeborg Poffet from France/Switzerland are interested of longlasting collaborations with each of the artist, as they do with each of them since years, combining all together in this project for the first time. The dialogues across the cultures is their aim. 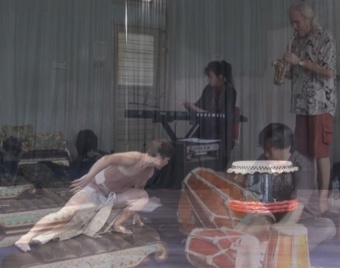 For their are living and working in Asia for several months nearly each year since 1990, working with artists from India to Indonesia, Vietnam, Malaysia and more, they seek a deepening mutual understandning between Asia and Europe. They live amongst us, they are everywhere. But you have to look for them, if you want to see them. So who are they, and who are we? inSection gets us close to the fascination of nature, bringing up questions about our dominance, know-how and abilities. Through the view of inSection we can destillate the question: what makes us human? Ist Neurologie, Manipulation, Altruismus, Beschützerverhalten, weitsichtige, komplexe Planung ein Zeichen von Intelligenz und Menschlichkeit? Stimmt es nicht nachdenklich, wenn eine Oozyste eines winzigen Parasiten gleich viel über Kriegsführung, Manipulation und Agenteneinsatz weiss wie das Militär und mehr über die Funktionsweise des Gehirns, als alle Neurologen der Welt zusammen? Und dieses Wissen frech in Fähigkeit umsetzt und skrupellos benutzt (wie unser Militär)? Woher weiss der Stachel der amerikanischen Schlupfwespe ohne MRT wo das Zielneuron in der Kakerlake zu finden ist, und darüberhinaus welches Toxin zum perfekten (sehr abartigen, aber praktischen) Verhalten führt? Welches Serum produziert oder verwenden die Eier des ., um zu erkennen, dass ihre Fressfeinde nah sind – durch die Augen ihres besetzten Raupenzombies? Wissen wir Menschen das schon? Könnten wir es produzieren und einsetzen? Wer würde es nutzen, wenn es so wäre? Die Antwort führt direkt zu Militär und Krieg. Sollten wir dankbar sein für unsere Dummheit? Wer genau ist hier eigentlich intelligent, wer hat wieviel Können? Vielleicht erhält jede Spezies genau das Wissen, das sie zum Überleben benötigt. Der Mensch hält sich für die Supermacht des Planeten Erde. Er könnte eines Besseren belehrt werden. inSection bringt uns die Faszination der Natur näher und lässt uns selber und unsere Dominanz, unser Können und Wissen hinterfragen: wer sind wir? Durch den Blick auf inSection können wir die Frage mitnehmen: Was macht uns Menschen aus? The name of this ensemble is derived from the set of instruments owned by UPI (Universitas Pendidikan Indonesia), the former Academy for teachers, now having a university status: “Kyai Kanjeng Fatahillah". This is a specific gamelan. 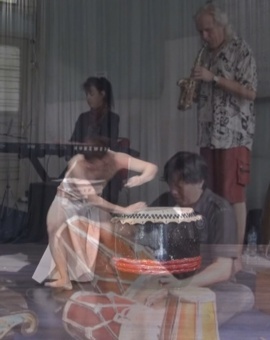 Apart from the usual it consists of instruments with a specific form and color. Lots of compositions have been made for them, as well traditional as contemporary. Founder of the ensemble is Iwan Gunawan, a composer and conductor. Meanwhile they have played concerts in Asia and Europe. 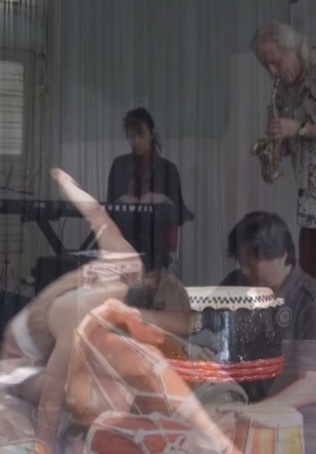 It is interesting to know that “Ensemble Kyai Fatahillah” is capable to play compositions been transferred by oral history as well as on paper in cipher (traditional notation) or as in Western notation. By this means the orchestra has been capable of playing contemporary pieces from international composers. 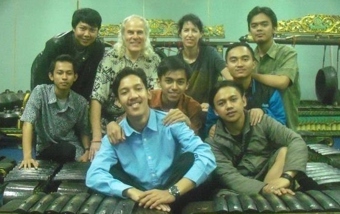 In 2006 Ensemble Kyai Fatahillah was taking part in the project “Tribute to Ton de Leeuw” in Jakarta, Yogyakarta en Surakarta. It was an enormous challenge, but also a chance to experience the process of “acculturation”. Since 2010 they work together with the composers and musicians JOPO & Ingeborg Poffet from Europe, especially combining the two tunings gender and slendro.